I cannot gush enough about this touching story of an English boy named Conor who is on the brink of losing his mother to cancer. 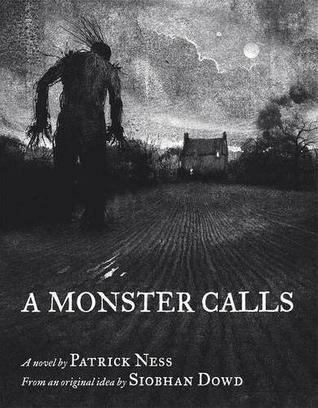 After Conor is visited by a monster, he must come to grips with his mothers illness and his feelings surrounding the heartbreaking situation of having a father who is absent and a mother in what looks to be her last days. The monster is not there to harm him or even scare him. He is there to tell the boy three stories and then to hear the story - the truth - from the boy himself. Early on we realize that Conor's mother is probably more sick than Conor lets on. He is only thirteen and still wrestles with the idea that maybe his mother will get better - she always had in the past. Conor need his mother to get better. They are all they have. Conor has no friends at school and has been the punching bag of the resident bully. He takes care of his mum at home, then goes to school and gets assaulted. Day after day this goes on. When the monster comes the first night we meet Conor, he isn't afraid. He deals with monsters everyday, and he is relieved to know that it isn't the one that has been haunting him in his dreams. The stories the monsters tells remind me of riddles. Your perception changes throughout the telling and in the end, you aren't really sure what to think. It all seemed so clear in the beginning, but by the end you are scratching your head in dismay. Who was the bad guy? Who was the victim? We learn that not everything is black and white, and there are indeed shades of gray in life. These stories upset Conor greatly. He feels tricked and is very confused. Was he to learn a lesson from these tales? I admit, I was fascinated to learn what it all meant. The illustrations in this story are beyond remarkable. The dark, ominous drawings remind me of a charcoal sketch you would find in a Japanese horror movie. They are chaotic, wild, and untamed. The monster rises from a yew tree and has arms and legs made of tangled branches, and his long beard looks like overgrown roots. The drawings are as important to the story than the words themselves. The two compliment each other, and I often spent more time admiring a picture than reading a passage.